Bluebell at Church View Holiday Cottages in Rosemarket, near Haverfordwest, Pembrokeshire sleeps 4 people. Church View Holiday Cottages near Haverfordwest are a group of holiday cottages. Bluebell lies within the grounds of the owner’s smallholding at Church View Holiday Cottages, along with three other traditional Welsh stone barn conversions. They are set around a courtyard and have been lovingly converted to provide a fantastic homes whilst on holiday. Bluebell is a unique property which has been lovingly converted to boast lots of character and charm. 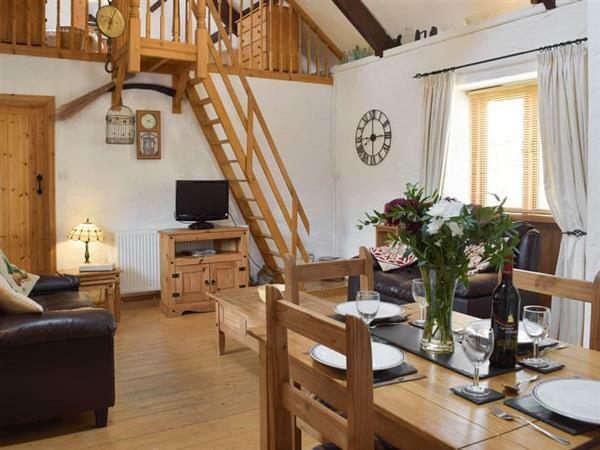 An ideal retreat for families and couples alike, this beautiful semi-detached holiday cottage offers exposed timber beams with vaulted ceilings and wooden floors. It has an airy, open plan dining and living space, with a separate kitchen which is ideal for cooking that perfect meal. Both bedrooms have timber flooring and beamed ceilings, and one is a quirky galleried room above the living room. Within the grounds are also two shepherd’s huts, as well as a wooden lodge to choose from, and roaming nearby are geese, ducks and even alpacas. Church View Holiday Cottages lie deep within the rolling Pembrokeshire countryside, and are set within the quant historic hamlet of Rosemarket. Here you can uncover the ancient church of St Ismaels, the Rosemarket Rings (which are a former Iron Age settlement) or sample some ales and local produce from the village pub, all of which are a stone’s throw away. Set between the two towns of Haverfordwest and the medieval town of Pembroke and close to Cleddau Estuary, this makes the ideal base from which to explore west Wales and the Pembrokeshire Coast Path. For a family day out, visit Folly Farm Adventure Park and Zoo with lions, rhinos and giraffes. Adrenalin lovers can pay a visit to Oakwood Theme Park. On rainy days, take a trip to Bounce Below, a large indoor trampoline centre - perfect for all ages. There is a beach 7 miles from Church View Holiday Cottages near Haverfordwest. With the shop 2 miles from Church View Holiday Cottages. The nearest pub and restaurant are 50 yards from Church View Holiday Cottages. Bluebell can be booked together with Primrose (ref UK10370 [Primrose]) via an interconnecting door to sleep up to 8 people, or additionally with Cowslip (ref UK10372 [Cowslip]), Heather (ref UK10373 [Heather]), The Crook (ref UK10374 [The Crook]), The Hurdle (ref UK10375 [The Hurdle]) and The Lodge (ref UK10376 [The Lodge]) to sleep up to 27 people. Most rooms at Bluebell have beams and wooden floors. Living/dining room: With 28 Freeview TV, DVD player and CD player. Kitchen: Galley style with electric cooker, microwave, fridge/freezer and dishwasher. Bedroom 2: Galleried with twin beds and restricted headroom. Oil central heating, electricity, bed linen, towels and Wi-Fi included. Travel cot and highchair. Welcome pack. External utility room with washing machine and coin-operated tumble dryer (shared with other properties on-site). 14-acre natural grounds with children’s play area (shared with owner and other properties on-site). Private parking for 2 cars. No smoking. Please note: There is a fenced pond in the grounds, 15 yards away. Holidays at Bluebell, Church View Holiday Cottages run from Monday to Monday. Pets allowed at Church View Holiday Cottages - Bluebell. For a better idea of where Church View Holiday Cottages - Bluebell is, you can see Church View Holiday Cottages - Bluebell on the map below. Church View Holiday Cottages - Bluebell is in Dyfed; should you be on the lookout for a special offer, you can find all the special offers in Dyfed. It's always worth checking to see what is on offer at the moment. Do you want to holiday near Church View Holiday Cottages - Bluebell (UK10371), you can see other cottages within 25 miles of Church View Holiday Cottages - Bluebell; have a look to find your perfect holiday location.